The eyes are supplied with a HUD customization “Smart Hud,” which allows you to customize 4 different zones with an infinite number of combinations. Customize everything! Colour regardless Iris, pupils, globes, lasers with Smarthud simply and easily. 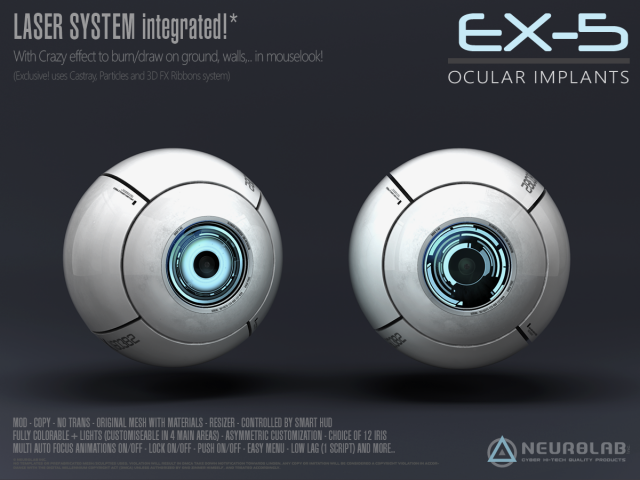 Includes 12 different Iris and many Animations options, these are all accessible via the hud. 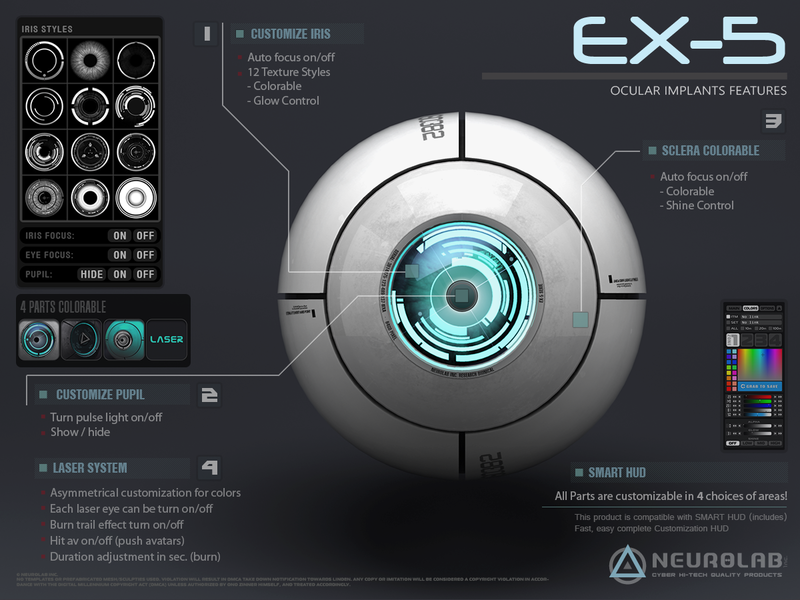 Auto-focus adjustable random Animations on 2 parts (eyes, Iris) and advanced pupil characteristics. The eyes are fully editable, customizable and fully colorable to go to your avatar. • Resizer system for the perfect fit! Fast and easy! perfect for all avatars, children and Petites Avatar! – Click to eye for open “Menu setting”, then adjust your size, volume, laser features.. Your eyes emit a sound when using the laser, use the “Sound” menu to adjust / mute the volume. You can replace the sound if you wish to edit it the right eye, remove the sound file in content and slip your own sound. Hit AV: activate avatars/objects detection/collision with lasers and Push them! Deletes the script in both eyes. You can not customize them using the SmartHUD and can not use the laser. Remember to always keep a copy scripted. 5 – now you can customize.. The first time you use the lasers you must accept the request for permission to track your camera. If you log out or move to another region this authorization will be lost and you will have to renew it at the next use of the laser. Regions: lasers work only on the area where your avatar is, if there is another region next you can not pull it, lasers will stop at the border.